Willie Lincoln, the 10 year old son of President Abraham Lincoln, has died. But while in the Bardo (a limbo-like state), Willie’s soul attempts to make contact with the boy’s living father. Two ghosts named Roger Bevins III (a closeted gay man who committed suicide) and Hans Vollman (a newlywed who died while lusting after his wife) narrate most of the story. They think they are only sick, so they refer to the coffin as a sick box. Bevins and Vollman have made it their mission to reconcile Willie with his father. 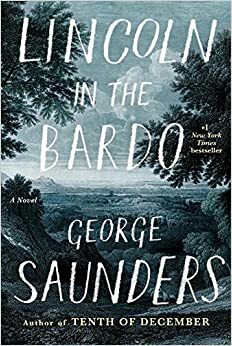 Lincoln in the Bardo by George Saunders is experimental fiction that explores love, death, guilt, and war through the eyes of eccentric ghosts. Passages from the writings of Lincoln’s contemporaries are combined with the observations of outrageous-looking ghosts to illustrate one of the most intimate and tragic events in President Lincoln’s personal life. If you have been following my blog for any length of time you know that I am a sucker for experimental fiction that explores large existential questions. After all the hype surrounding this novel, I expected Lincoln in the Bardo to become one of my favorite books of 2017. Unfortunately, it did not live up to my expectations. An experimental narrative structure can help or hurt a story. It is usually employed to explore more abstract aspects of life. When evaluating experimental fiction, I consider how the style relates to the questions or themes the novel is addressing. Lincoln in the Bardo is about one of the darkest moments in President Lincoln’s life: the death of his son Willie. The chapters that deal with Lincoln’s grief were some of my favorite chapters. I enjoyed reading Lincoln’s most intimate thoughts. The passages from contemporary writers were also quite powerful because they placed the boy’s death in the larger context of the ongoing civil war. Seen from the perspective of the civil war, Willie’s death allowed President Lincoln to experience what thousands of parents around the country were already experiencing. Unfortunately, the Bardo itself felt like a distraction from the overall story. The ghosts reminded me of the monsters in Nightmare Before Christmas. As someone who has had personal experience with the death of a child, I expected the novel to cause me to revisit certain thoughts and events. The outrageous and at times vulgar behavior of the ghosts prevented me from feeling for Lincoln’s loss. Just when the ghosts began to discuss larger existential questions, the dialogue would be interrupted by an event that had nothing whatever to do with President Lincoln or Willie. If the Bardo was supposed to serve as comic relief, it was definitely overdone. Overall, I felt that Lincoln in the Bardo was all style and little substance. Maybe it’s not entirely the book’s fault. I picked up the novel for very personal reasons. I may not have been the intended audience. I’m interested in knowing how other readers who know something about Lincoln’s grief felt about Lincoln in the Bardo. In general, I want to know what readers thought of the ghosts. What role do you think they played in the novel? Did you enjoy the narrative style?